I'm doing fewer gadget reviews on this blog for what I think is the good reason that an awful lot of people are making an awful lot of gadgets very well indeed. It's probably indicative of my age that when I started writing about this stuff, there was some poorly-made tat out there and some weedy little speakers that were quite overpriced. 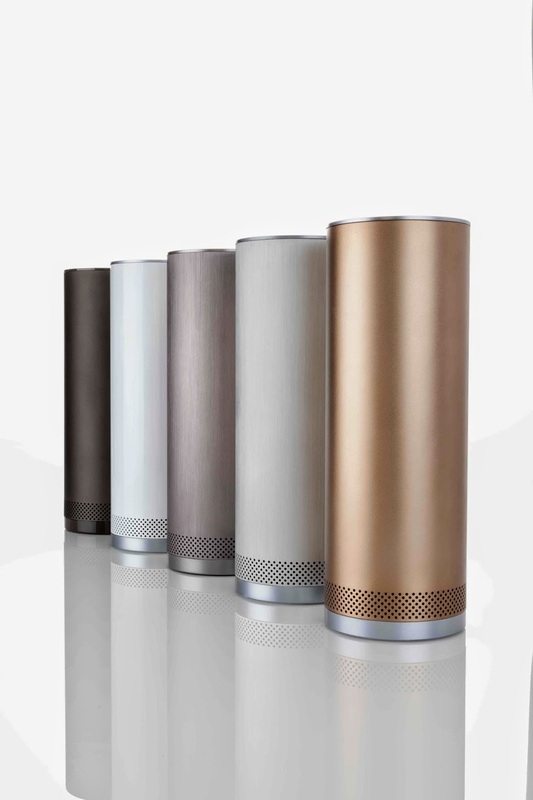 Which is why it's a pleasure to write about the Stelle Pillar, £249 from an Apple store near you (they will also be available elsewhere I'm sure). You can see from the picture that they come in different colours so you're likely to find one that will look good in your living room. The better news is that they're chargeable with the enclosed adapter so proximity to a wall socket isn't an issue when it's full of juice; it will also charge an external device through its USB socket. Mine is black and it was very easy to pair with my iPhone although it seemed to struggle when I tried to add my iMac it wasn't so keen; it recognised my Nexus tablet OK but switching between this and the phone wasn't great. If you don't mind pairing again every time you want to use a different product with it, you'll be fine in my experience. So, what about the sound quality? The answer is that it's very good. It has speakerphone capacity which is great, it has 15 hours of playback and although I'm not one for quoting decibels at people - they always seem a bit meaningless to me in the context of a review - it had a decent bit of bass oomph so that you can enjoy listening to music quietly as well as loudly. Gripes are few; it came with a plastic disc whose purpose I've yet to ascertain (I suppose it can stand on it but...why?) and for a geek like me switching between devices could have been smoother. The speakers being built into a small unit means there is inevitable next to no stereo "spread". My wife had to fiddle with her iPhone audio settings before she was convinced it could play classics reasonably (my Beatles, Stranglers, Madness and other middle-aged-rocker fare were fine). And when you switch it on, the voice that says 'hello' is Australian - that's not a gripe, just a bit of trivia, before I get complaints! For the vast majority of listeners I suspect it'll be a very good buy. This evening I'm going for a coffee with a colleague. She's been very kind about my weight loss - I've mentioned my efforts on here a few times (well, you would). I said I'd bring people up to date about my weight loss on this blog - anyone who's interested, read on. Here are the facts. 16 months or so ago needed some benign, hereditary cysts removed from my scalp. I was expecting it all to be a bit routine. I visited the doctor and since I was 47 they put me on the scales. I was told I was on the high-risk list for diabetes and my blood pressure suggested a stroke before 50 was entirely probable. That plus the fact that my father hadn't made it to 50 because of his heart (we'd always blamed the smoking) did a lot to focus my mind. So I went on the 5:2 intermittent fasting diet (huge, huge thanks to my friend and colleague Grenville Bradder for drawing my attention to this) and reintroduced the gym into my life - moreso since November as my chiropodist finally zapped an ingrowing toenail which had been a persistent little bugger. So, having unknowingly crept up to 18 stone I'm now just about over 14. The GP surgery tells me I should lose about one kilo (2lbs) and then focus on staying there. The pictures below tell a story - the tieless one is from 2010, the one in the middle is from 2014 and the one on the right is not quite a month old. The one in the middle is my least favourite - the suit is tailored, the hair freshly coiffed and I clearly think I look something. So my coffee-drinking colleague said to me a little while ago, this must have done a lot for your confidence. And yes, the answer is that it has - but you might be surprised to hear it took a while. At first it was shot to pieces - and that's what they don't tell you when you lose weight. I do a lot of presentation work on stage, which is why there are pictures of me doing so. And over the last couple of years I've been doing some stand-up comedy as well. Some of it's been OK - the first one was a rant about the tyranny of slim-fit shirts, which chimed with some people. In terms of the presentations on, say, social media (I wrote a book on it in 2008 that came out in 2009 when it was pretty new) I'd occasionally refer to this blog, saying something like "I run a small men's lifestyle blog...not a lifestyle blog for small men, obviously [PATS GUT]..." and it would get a suitable laugh. So, guess what? The weight went down and I didn't have my fall-back humour subject for when things were flagging, either for the corporate gigs or for the comedy. Whoops. The comedy started going downhill immediately - I made the mistake of trying the slim-fit shirt routine as a fairly averagely-built man. The audience was bemused - and I found myself explaining I used to be bigger. Only a brief sentence or so, but if you have to explain why something's funny, it probably isn't. You could argue that on some level I'd built being fat into my identity and found it rather comforting. Indeed, you might think I'd unconsciously not only justified it in my mind but made it essential. What I'm certain of is that on stage during 2014 until as recently as last week I could feel my legs shaking, which hadn't happened before. That wasn't the only thing hitting my confidence. If you're about to go on stage or TV, the natural thing to do is to check yourself in the mirror - is the tie straight, the hair OK, boring stuff like that. After a major change as I've had, for a while it didn't look like 'me' looking back. OK, it was and is a better look than I'd had for about 15-20 years, but that feeling of going in front of an audience looking unfamiliar and without the fallback fat jokes was unsettling. If you lose weight noticeably (and believe me the best part of four stone is noticeable) you have to adjust to the new look and become comfortable with it. It can take time. I went to my friend and comedy mentor Tim Dingle for a bit of help. We had a session in which he explained (as a bit of a psychologist) that my feeling insecure on stage was b*ll*cks because when you break it down, it means I was concerned the audience wouldn't be satisfied I was fat enough. Which was of course nonsense. We worked on some calming techniques before and during presentations and stand-up routines. We looked at different ways of producing jokes. I also spoke to my good friend Dr. Lynda Shaw, whose knowledge of psychology is considerable. She said my belief that I'd identified myself as 'fat' and grown to welcome it was probably right, and that I needed to adjust to the new version. She also suggested getting rid of all of my 'fat' clothes; I was reluctant but this actually took care of itself. I had a few of my tailored suits altered but there's only so much they can do. The suit in the middle picture above now has a waistline that fits but they can't make the armholes and legholes smaller, and the sweep of material at the front (including the length of the lapels) to cover the gut can't be reduced, so you end up with something that doesn't actually fall off but which looks like a very baggy suit indeed. So I now have one suit that fits. I may need to buy another. Losing weight can cost a fortune. They don't tell you that either! Rationality has kicked in now. I can see at a glance that the bloke in the picture on the right is going to be less prone to coronaries (like the one from which my dad died at my age) and the GP has confirmed that any risk of diabetes has receded into the distance. At 49 I look and feel loads healthier than I did at 45 and probably 35 - more fool me for putting the weight on in the first place, but I'm fine now. I went jogging with a teenage family member the other day - they got through about a sixth of my normal routine. I hadn't realised my energy levels had lifted like that, but clearly they have. I'm not blogging about this to show off. I just think there's an untold side to the weight loss issue that will affect middle-aged people of both sexes - seriously, there can be downsides to work through. If it's happening to you, it's worth persevering. Had you not read everything I've written and just seen the pictures, you wouldn't see any advantage in the fat versions at all, and no matter how uncomfortable you might be with a slimmer version of yourself at first, it's the same thing.